Scholarships now available… but apply soon! Sons of the American Revolution (SAR) – Click here to download application. There are two parts—the application and the 4 generation ancestor chart. This scholarship application is reviewed by the SAR committee and a winner is chosen to receive a $1,000 scholarship for Weber State University. This is a winner for the State of Utah and is sent to the National level. If the application wins on the National level there are three scholarships available– $2,000 for third place, $4,000 for second place, and $8,000 for first place. 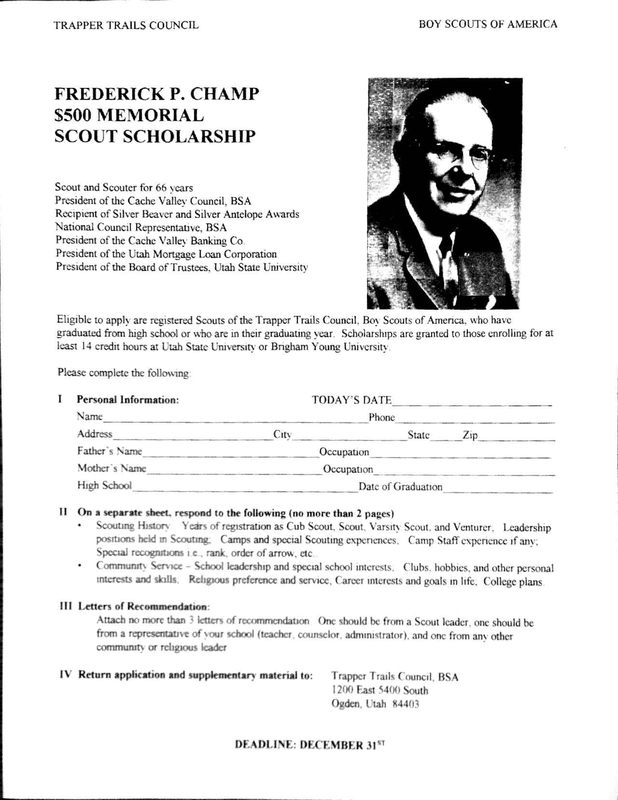 Frederick P Champ Scholarship – Click picture to save application. This is a council level scholarship for $500.00 to be used at either Utah State University or Brigham Young University.